Located in London, the Houses of Parliament (also known as the "Palace of Westminster" or "Westminster Palace") is the building where the two British Houses of Parliament (the House of Commons, and the House of Lords) meet. It is an extremely recognizable building, known around the world, which was built in the 19th century in the Perpendicular Gothic style. For tours during the Summer when parliament is not sitting. For all types of viewings and tours, it is generally best for UK residents to arrange it through their local Member of Parliament (MP). At the Northeast corner of the Houses of Parliament stands a Clock Tower, which houses the world's largest four-faced chiming clock. 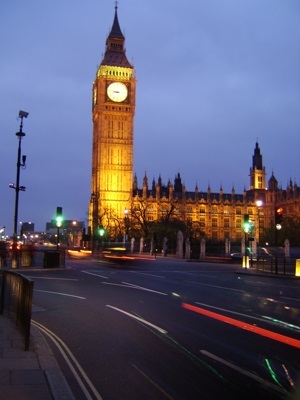 Most people refer to the tower as "Big Ben", but in fact, Big Ben is actually the nickname of the Great Bell, the largest bell in the tower.